There 7,099 distinct languages spoken around the world according to the 2017 Ethnologue language database. Some countries speak hundreds of languages. 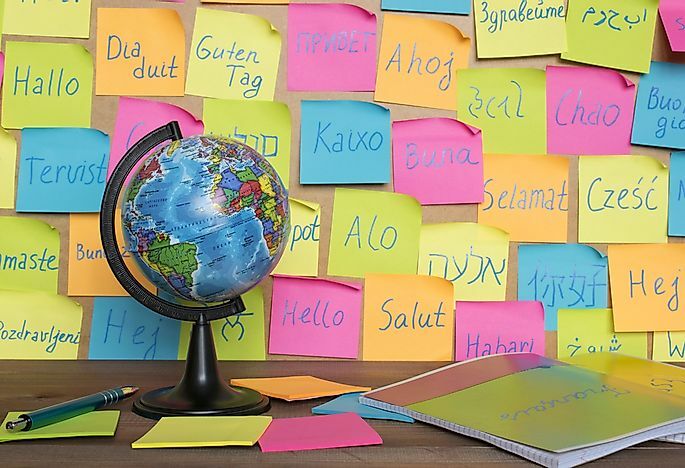 There are about 7,099 languages spoken in the world. This number is constantly increasing because new world’s languages emerge every day. These languages are dynamic and living. With modernization, a third of these languages face the risk of extinction. Many factors such as spread of old civilizations, terrain, and cultural history determine the number of languages spoken at a particular region. A great number of people use major languages such as European or Asian languages. Pacific languages that make 18.5% of the languages in the world have few speakers than what the region registers. The Asian continent has the largest percentage in terms of the number of languages spoken, which is 32%. Africa continent follows closely with 30%. Pacific is third with 18.5%, America fourth with 15%, and lastly Europe having 4%. These statistics reveal that almost two out of three languages spoken are from Asia and Africa. Statistics further reveal that Asia has 2,294 languages with 3.9billion speakers while Africa has 2,144 languages with 887million speakers. Papua New Guinea has more than twice the number of languages spoken across Europe. It is a multilingual nation with over 840 languages spoken, with twelve of them lacking many speakers. The popular language is spoken by over 200,000 people. Some of the languages have less than 1,000 speakers. The local languages in Papua New Guinea fall under two categories: Austronesia and Non Austronesia. Papua New Guinea’s official languages are Tok, Hiri Mtu, English, and sign language. Indonesia has 709 languages spoken. Indonesian language is the country’s official language. Here, most languages are Austronesian. The de jure is an official language passed by the Indonesian constitution. Other regional languages spoken include Javanese, Sundanese, Minangkabau, and Musi. There are 527 languages spoken in Nigeria. However, Nigeria has many other unclassified languages. The languages in Nigeria fall under families such as Niger-Congo family language and Afro-Asiatic family language. However, the official language is English. Regional languages include Hausa, Igbo, and sign language. There are 454 languages spoken in India, with English and Hindu being official. Hindu language is profoundly spoken and it is the fourth widely spoken in the world. Today there are 422,048,642 speakers of Hindu in India. Other languages in India include Bengali, Telugu, and Odia among others. There are 347 languages spoken in the United States with English language being supreme. The immigrants from other countries like Mexico, Germany, Arabia, Spain and Russia have greatly influenced demographic patterns in the United States of America. China has more than 300 languages spoken. The languages are popular in Tibet, Taiwan, Hong Kong, and China mainland. The popular language is Mandarin Chinese spoken by more than 955 million people. However, Standard Chinese is the official language. Cantonese is also an official language with other regional ones such as Wu Chinese, sign language, and English. There are other countries with diverse spoken languages. These include Mexico with 290, Cameroon with 280, Australia, 259, and Brazil, 227. Spanish is the popular language in Mexico but Amerindian is the original language. Cameroon’s official languages are English and French while in Australia, Arabic, English, Italian, and Greek are dominant. On the other hand, in Brazil the official language is Portuguese. The Portuguese spoken also goes by the name Brazilian Portuguese.